This isn’t Gelato Messina as you know it. 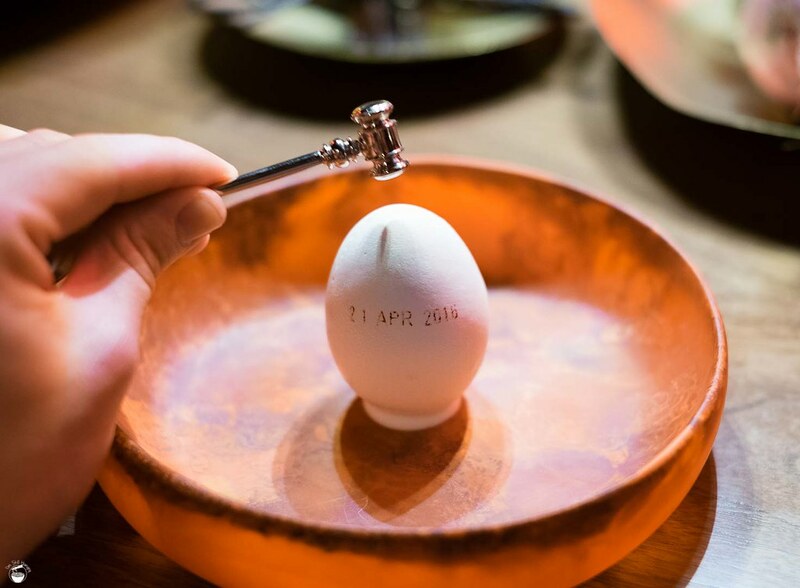 Out goes seven scoops of gelato (though that’s not a bad idea either), in goes seven courses of painstakingly-crafted experimental desserts marrying ingredients, flavours and textures that you would never in your right mind associate with the concept of ‘dessert’. 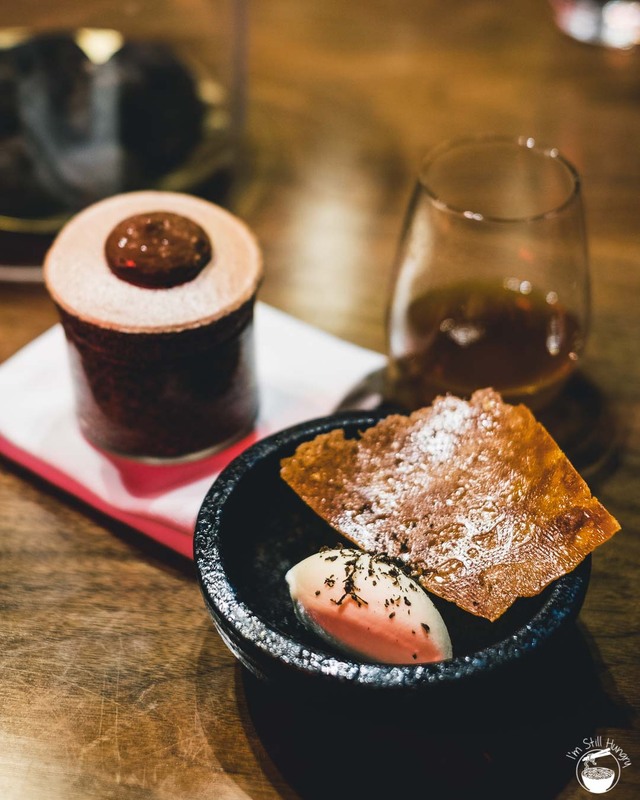 Add in a non-alcoholic drinks pairing and a cool $130 price tag (totally worth the money), and you have pretty much Sydney’s only dessert degustation experience. Welcome to the Messina Creative Department’s Dessert Bar Degustation. The site is where the old Messina “create your own” soft serve dessert bar concept used to be. The soft serves that came out of that dessert bar were undoubtedly delicious, but given how much competition there is out there now (Aqua S, Good Times Ice Cream, Hartsyard, Devon on Danks to name a few), the move by Messina was a deft one that allowed them to avoid being made irrelevant, as well as to start something totally novel. An intimate, high-end prix fixe dessert offering has been a dream of Palumbo’s since the beginning. 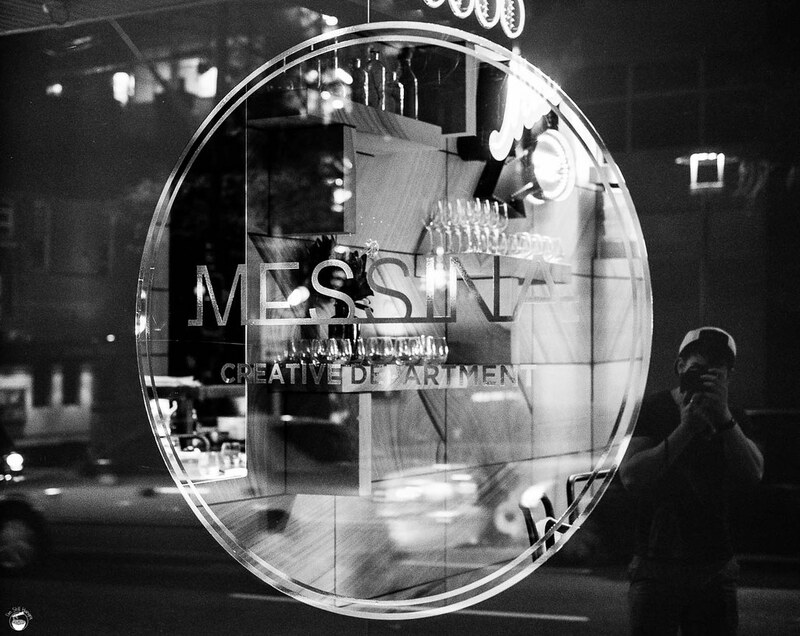 At Messina’s Creative Department, there are two sittings per night – 7pm and 9pm. There is only one table: a communal setup of eight seats. The French Legend. Ladies one at a time please…Lemme just step out of the way first. 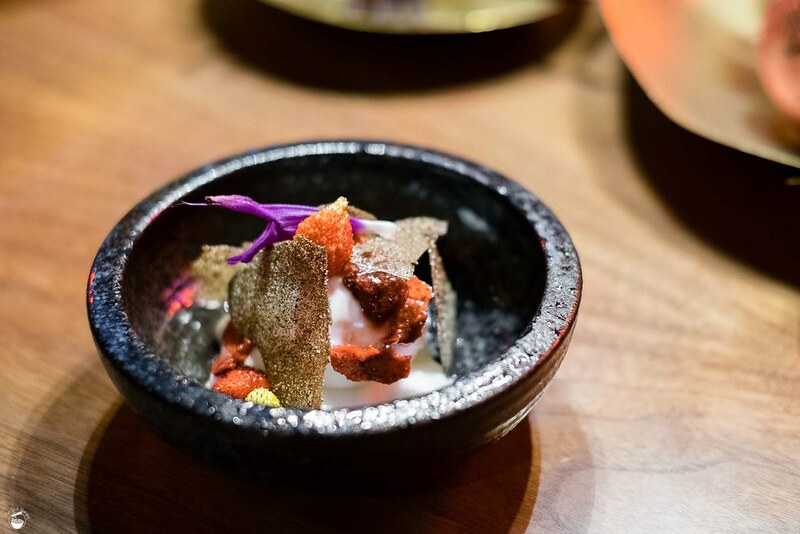 And it’s novel in the true sense of the word: the desserts are made from ingredients with an intense focus on origin, flavour & texture combinations will challenge as much as delight. 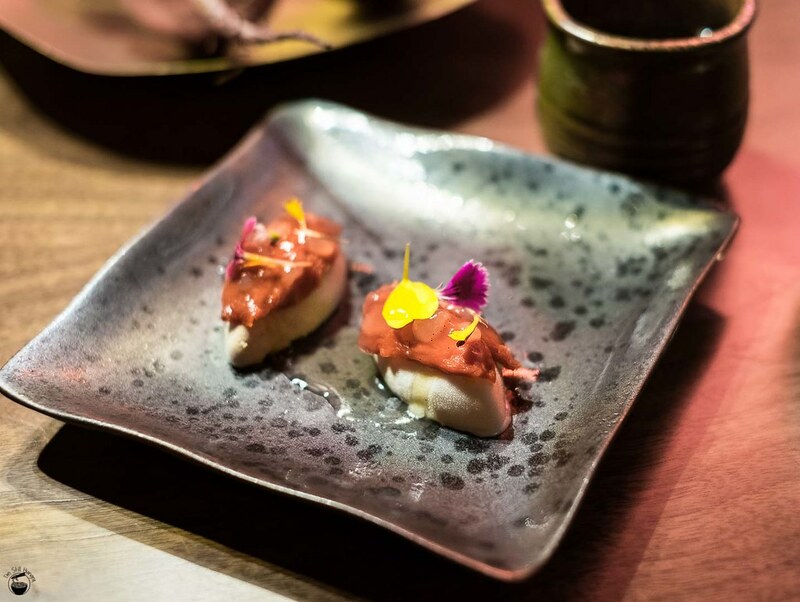 Nobody else in Sydney is doing anything even remotely similar – and that even includes the current ‘Sydney Dessert King‘ so to speak. And then we have Palumbo’s secret sauce: Remi Talbot. 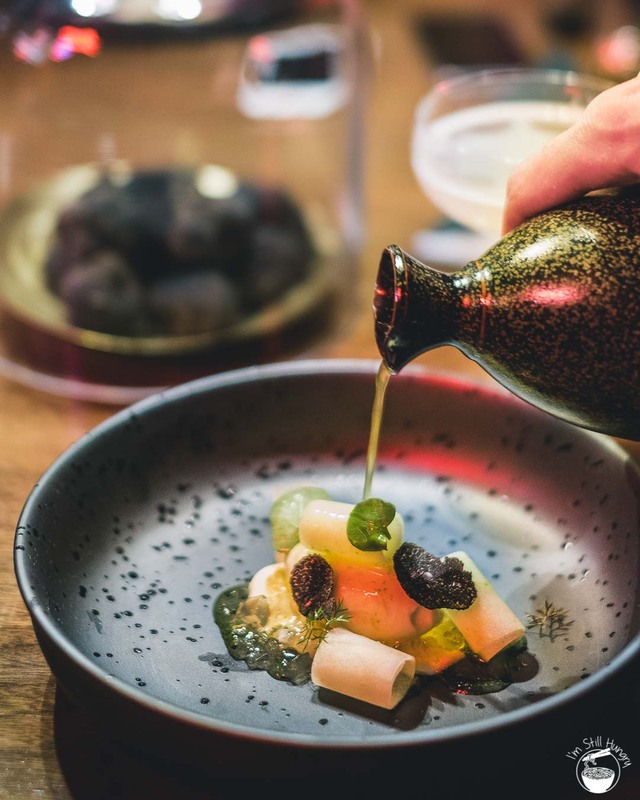 With work experience accumulated in Denmark, London and Japan (at the Michelin-starred Den restaurant, no less), and most recently, in well-renowned restaurant Pescatore in Christchurch, New Zealand, he’s no stranger to all things sweet. It’s a science experiment, and you dear guest, are the guinea pig! Remi’s whirlwind of creativity manifests itself in the super geeky science-lab set-up of the venue, with mason jars, fermenting jars taking up all visible shelf space. 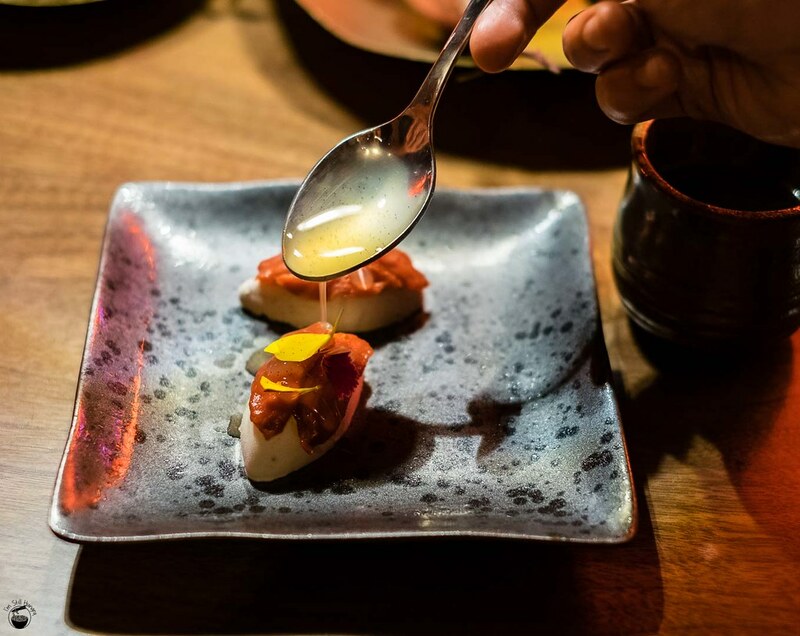 Couple the variety of these base elements and the availability of seasonal ingredients, and it’s no surprise the menu changes with incredible rapidity, with the team always in experimentation mode. 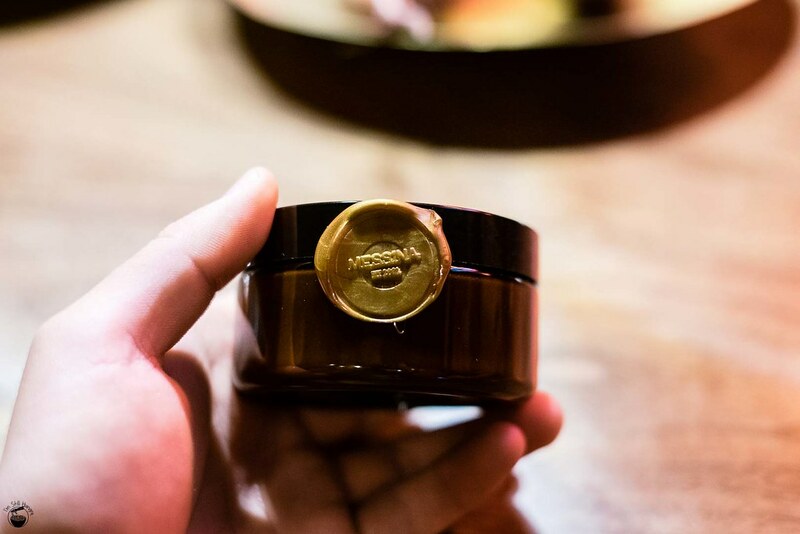 Particularly noteworthy is how the team always somehow manage to get hold of ultra rare or ultra difficult ingredients in – such as DOC Sicilian pistachios, or true dulce de leche from South America. Produce nerds would have a ball of a time here. Other than one or two stalwarts in my experience (four visits and counting), there’s never going to be a ‘signature dish’. It’s a perpetual science experiment with paying diners as the guinea pigs. That’s usually a cause for concern, but with the talent that is Talbot & Co at the helm, it’s nothing but awesome. 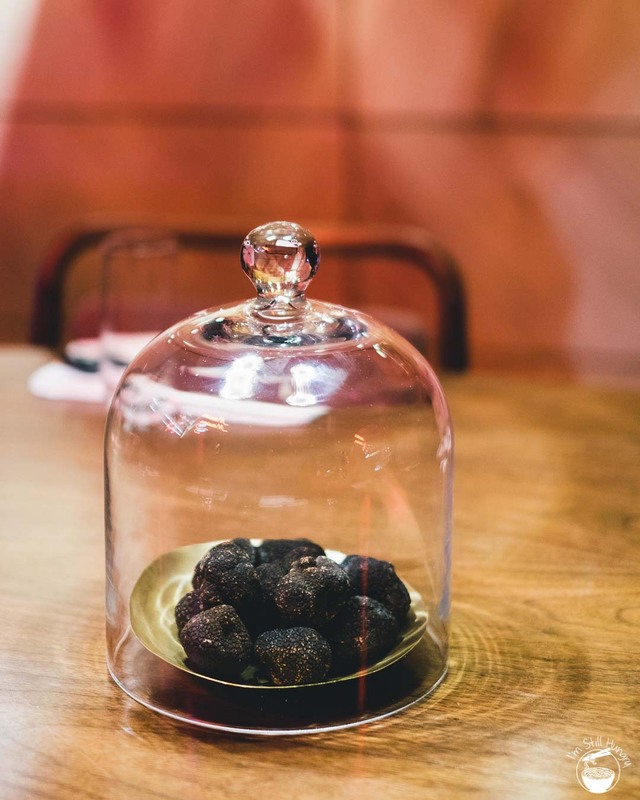 Every winter, the Creative Department runs a limited two-week truffle dessert degustation. 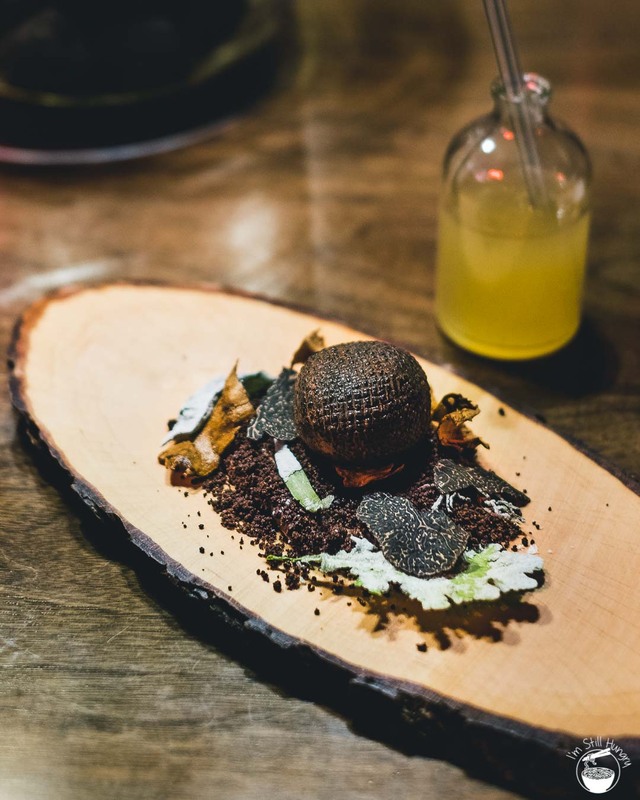 Due to its limited time nature, this segment will simply be a photo post – you’d have to wait till next year to book the next truffle experience, and the dishes would undoubtedly have changed. 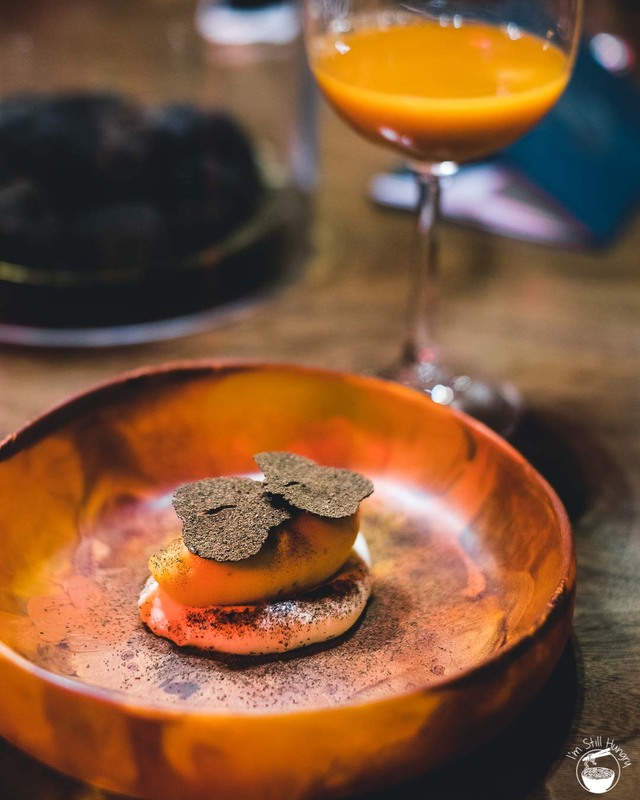 Suffice to say that of the seven dishes served, seven were absolute hits, with the roasted mandarin sorbet, black truffle gelato w/potato & parmesan risotto being absolute standouts. In fact, the black truffle gelato w/potato & parmesan risotto is probably one of the tastiest things I’ve eaten this year. Yes, I say that without hyperbole. I mean, you’re talking to a guy who has willingly paid $130 four times just to eat sugar, after all. If the photos and my attestation doesn’t convince you, scroll past this section for 2016 cover, which has far more detail (and far worse writing…ahh how times have changed). Fun fact: each diner’s starting spoon was different. 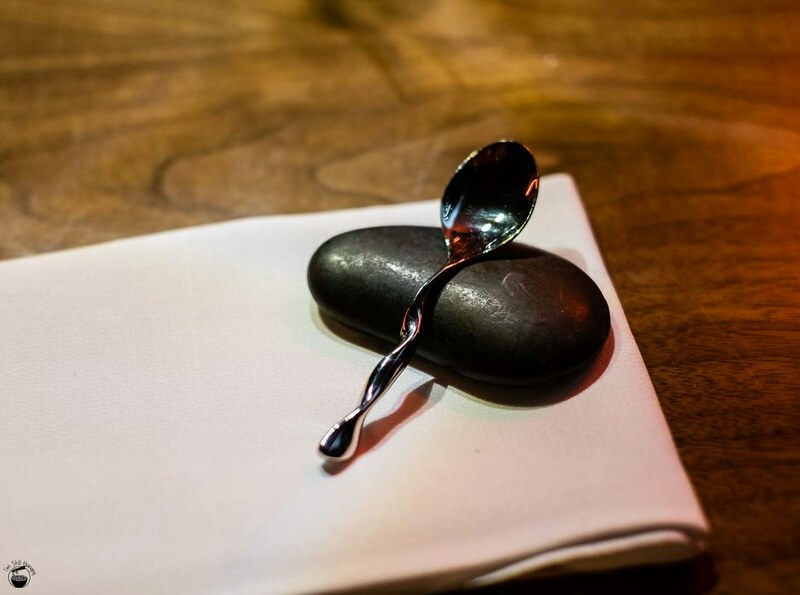 Mine is pictured above, another guest received a spoon with a love heart-shaped bowl! Fun fact #2: in true French tradition, the women at the table were served first. Patience, gentlemen! Everyone’s first spoon starts off different. And we’re off to a running start! The first course is a purple basil & beetroot vinegar granita. The purple basil comes from Sackville NSW, while the beetroot was unearthed at Pitt Town NSW. 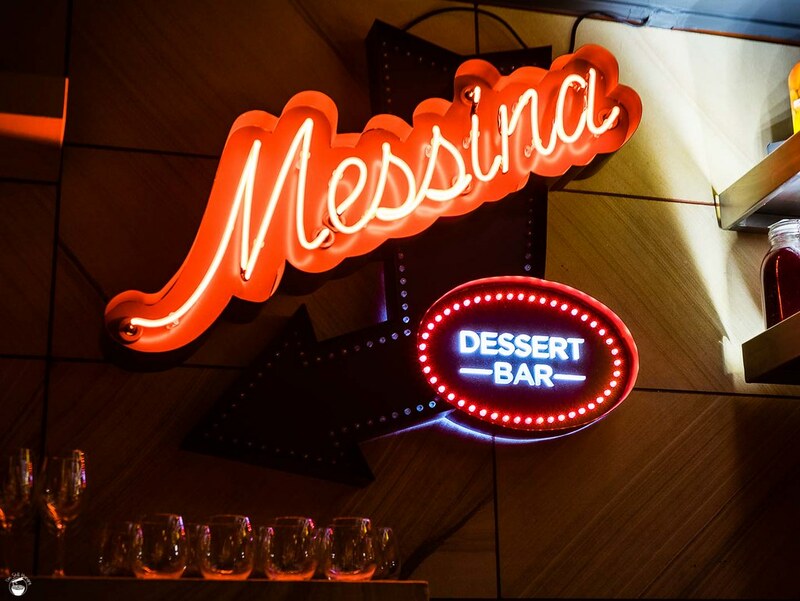 The ice bowls come from NSW…I mean, Messina’s kitchen. Yeah, they made the ice bowls in the kitchen. Ahem. 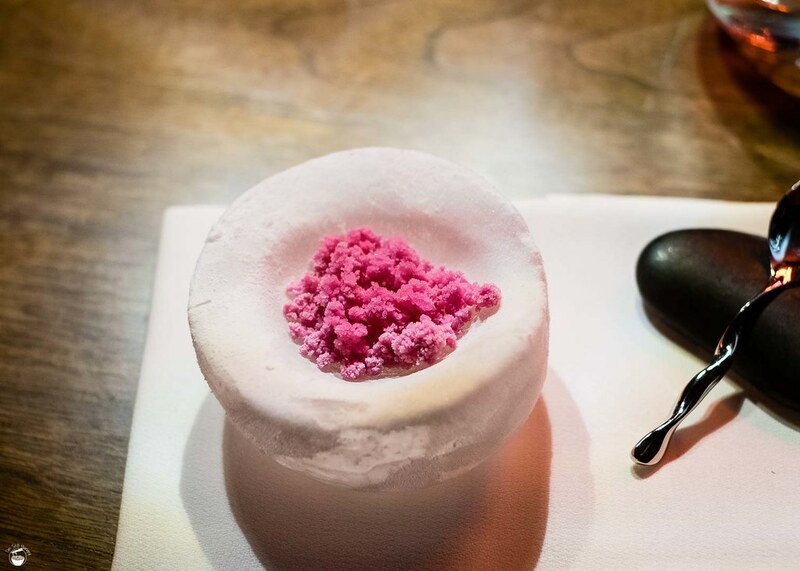 Granita in and of itself is as well-loved as it is well-known; Messina & Remi Talbot’s spin on it is to include a hint of acidity and earthiness by infusing beetroot vinegar into the mix. But let’s not get ahead of ourselves. Before consuming, Talbot walks around the table and drips a few drops of extra virgin olive oil (from Cudgegong NSW) into each bowl. A few eyebrows raised at this, but my spoon was already digging in barely before the last drop of oil touched the granita. 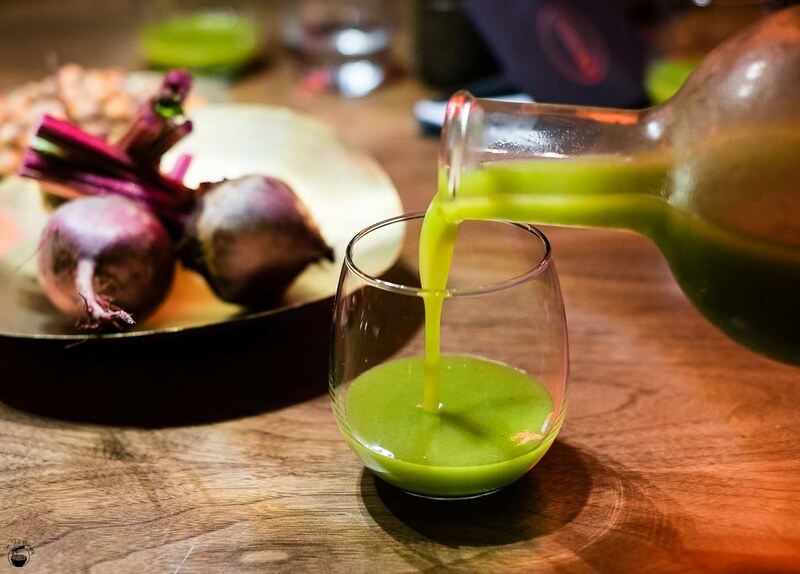 The results aren’t for show – the beetroot vinegar presents itself very eminently on the palate. The taste is very sharp, but is always brought back ever so slightly by the sweetness of the granita and the robust vegetal nature of beetroot. The inclusion of oil added just a smidgen of freshness to the mix, and actually ended up making the granita taste of a sweet balsamic. A deceptively simple palate cleanser with a great result. Me and my friend were already having our skeptical minds changed. Maybe it’s the sugar. I did not pay $130 to sign up for a chemistry class, but I don’t mind as much if I’m mixing my own drinks. That’s exactly what the D.I.Y P.S. soda wattle cola is, but we have to get there ourselves first. Let’s go through each item one by one. 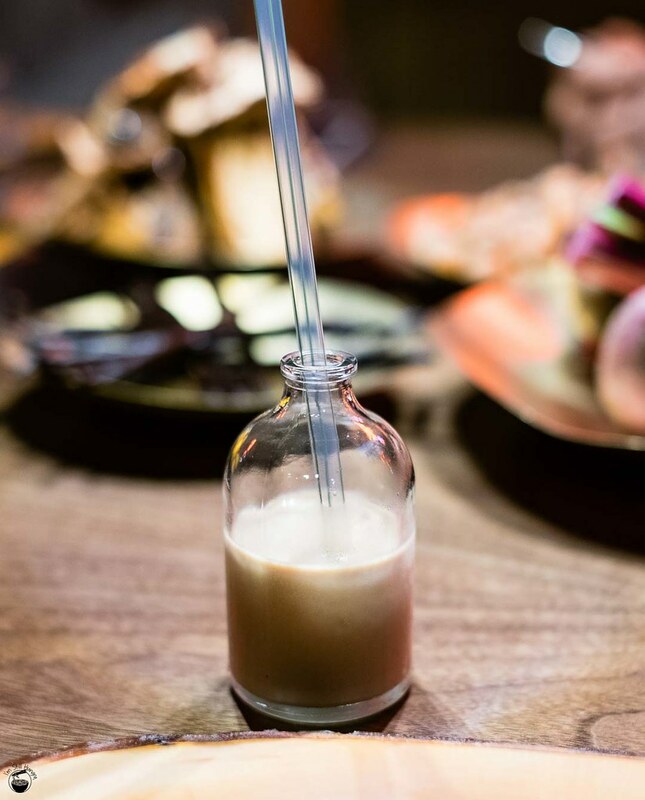 Test tube: this is filled with wattle cola made by P.S. 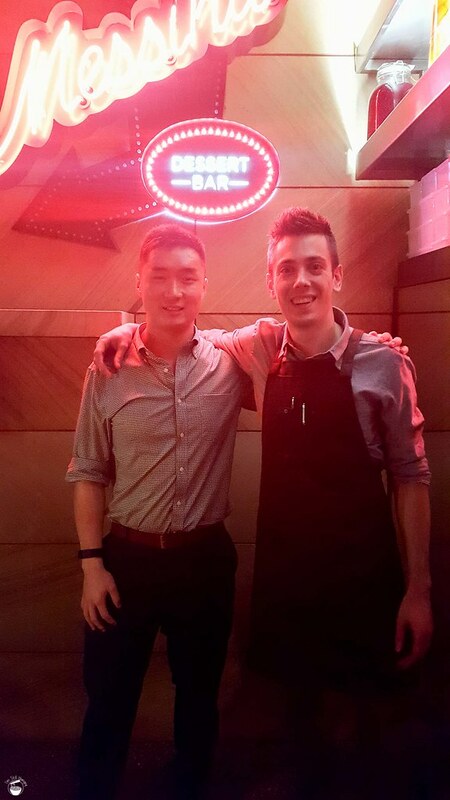 Bar & Soda, a boutique specialising in sodas & drinks to complement spirits. 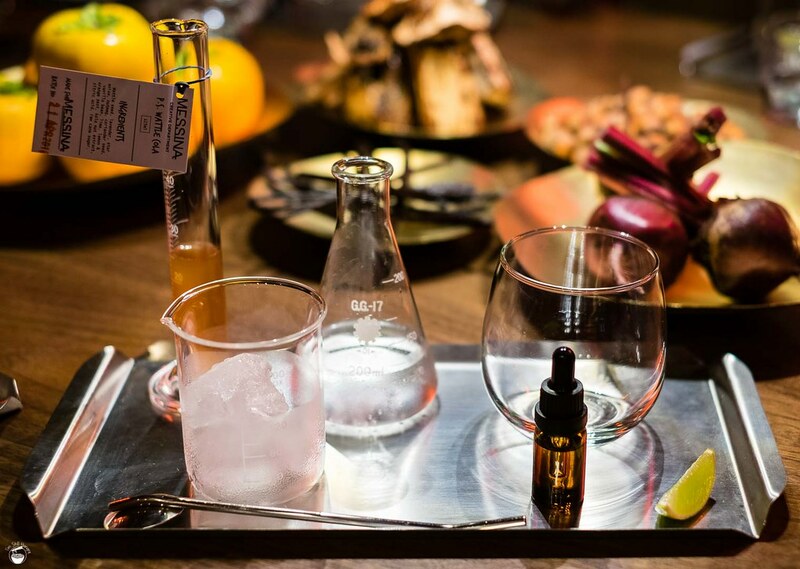 The orange-hued soda consists of wattle seed, lavender, star anise, nutmeg, coriander seeds, waffle bean, lime, lemon & orange zest, kola nut extract, citric acid & raw cane sugar. Man, that’s a mouthful, literally and figuratively. 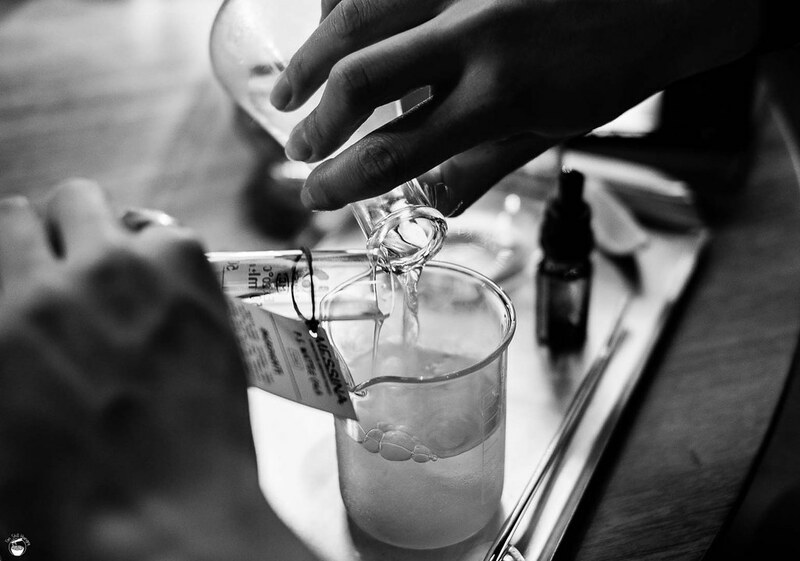 Dropper bottle: vanilla lemongrass vinegar – to taste. The trick is to pour the water and P.S. 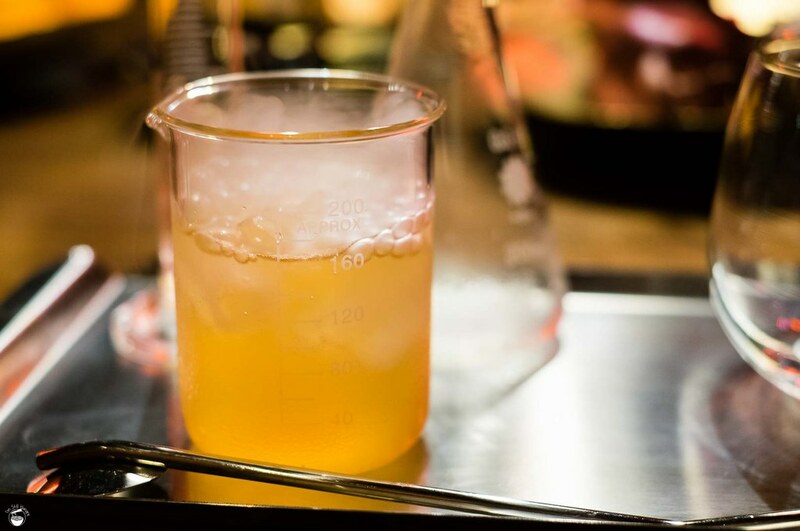 cola into the dry ice beaker at the same time. 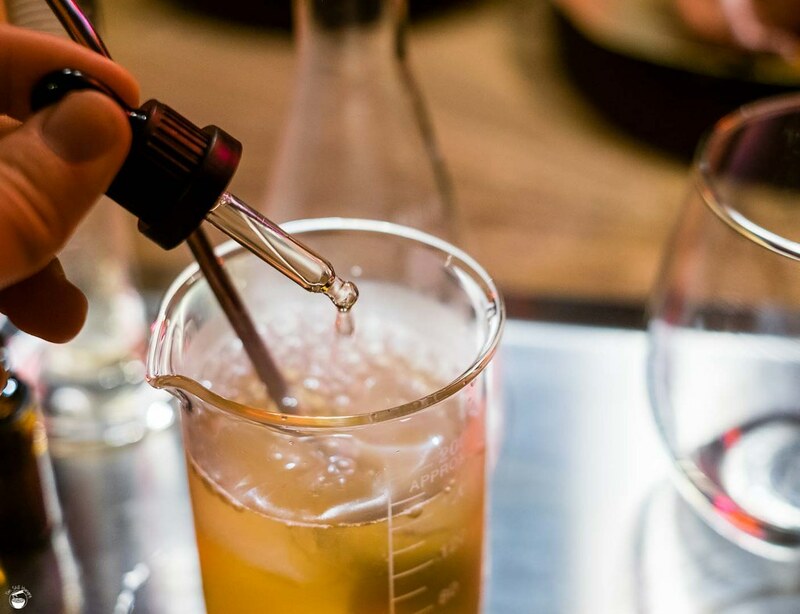 The dry ice cools the drink down, and in turn, sublimates directly into carbon dioxide causing the fizzing. Concurrently, some of that carbon dioxide will be trapped within the liquid – which results in the formation of the soda component. Yeah, I should have continued studying chem in high school. Oh well. At this point, I should be forgiven in taking way too many photos/videos of the drink. It’s not every day I get to play with my consumables like this – another part of the dessert experience I greatly enjoyed! You want vanilla? We’ve got vanilla. 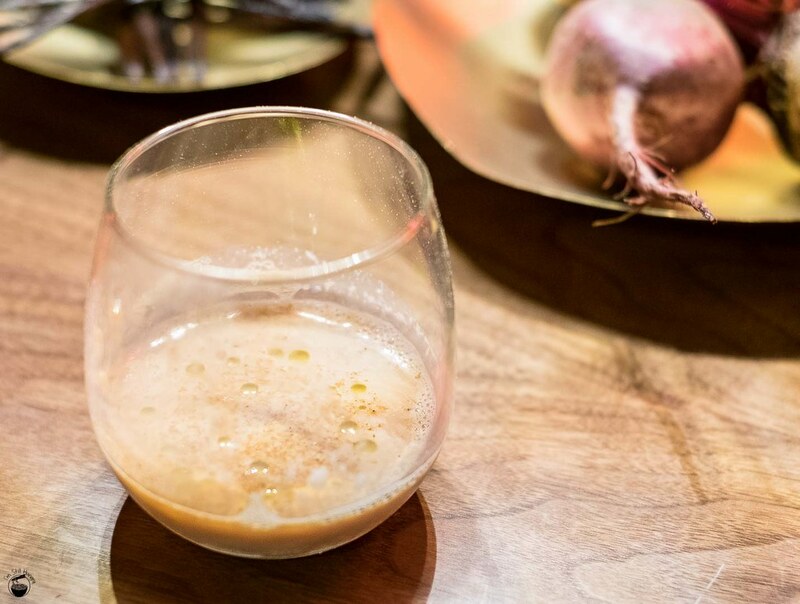 At this juncture, we had the option to add vanilla & lemongrass vinegar to taste for that extra kick. I generously used up about half the bottle – if I’m going to drink, at least make it a strong one. The result is fantastic. I was a bit skeptical as I had a less-than-nice experience with wattleseed cola at Bennelong; Messina is something else entirely. It’s got sweetness akin to that of pears, plenty of complex astringencies from all those spices in the cola, and a good kick of vanilla and zestiness from the lime. 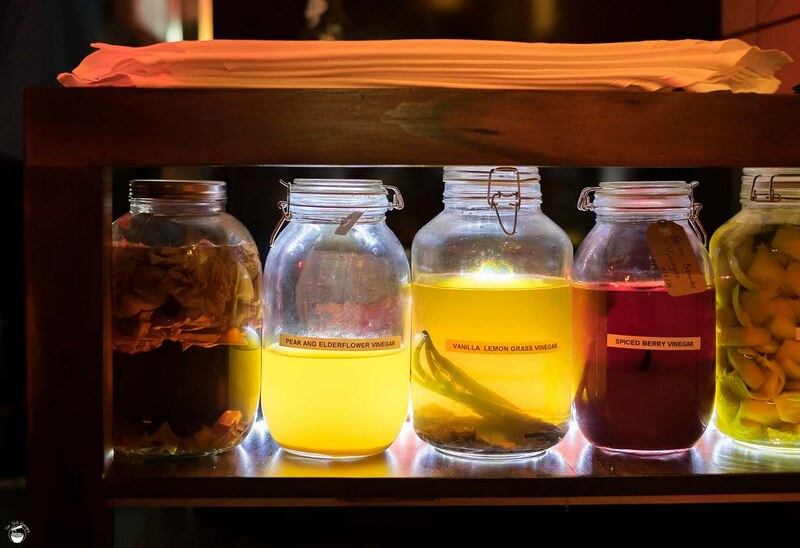 But most of all, it still tastes like a “bush tucker” style drink – the smokiness and cinnamon-like wattle flavour is never overwhelmed, and that’s a good thing. But I should probably talk about the actual dessert(s) with which the drink is meant to be paired. 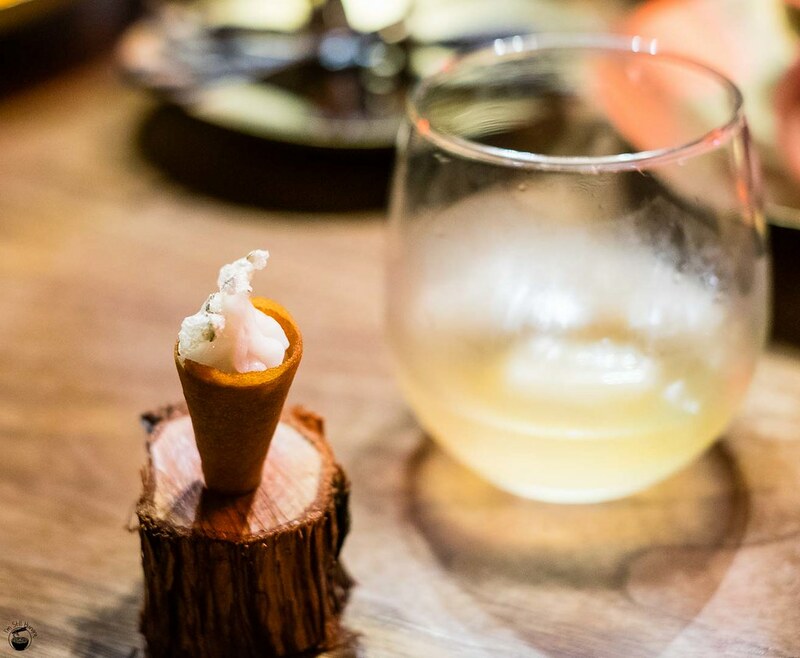 Say hi to the diminutive pear vinegar and elderflower sorbet w/crystallised thyme in a hand-rolled molasses cone. The sorbet is really refreshing, and also far creamier than a sorbet should be. How that magic was accomplished is something I just do not know. Its flavour is light, reminiscent of a sparkling wine with floral touches and a bit of that minty dryness from thyme. Delicate and delicious. Molasses (aka black treacle) is the byproduct of sugar refining, and sports a bitter, earthy but still sweet taste. The cone pretty much represents these flavours in biscuit form. As for its texture, it’s crunchy at first, then chewy. A small morsel that’s an absolute tease. 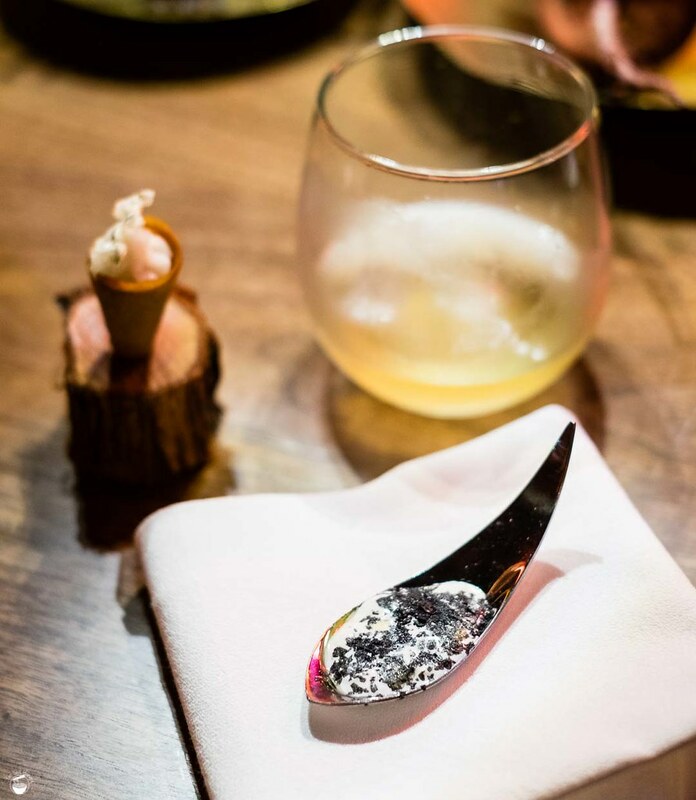 The second mini-dessert constituting this course is a creamy fresh cows milk stracciatella w/EVOO & bamboo charcoal salt. Stracciatella is a cheese that’s very similar to the centre part of burrata, being defined by its high level of creaminess. As I described in my tasting notes: “it’s creamy AF“. As for the flavour of this spoonful, it’s very savoury. It’s almost like a palate cleanser for the desserts, if that were such a thing. The cheese is of medium strength, and the bamboo charcoal salt does lots to bring out the cheese’s natural flavour. Again, it’s gone far too quickly. Dear reader, by now, I’m sure you’ve already disowned all connections with the traditional gelato Messina is renowned for. This experience is literally incomparable. The next course is a goat’s milk sherbet w/strawberries, liquorice & lemon myrtle thyme. It’s probably the most beautiful dish of the night, and also one of the tastiest. The star are those strawberries – which, just for the sake of informing – are actually only about the size of the tip of your pinky. They aren’t normal strawberries, they’re alpine strawberries. Otherwise known as wild strawberries, we were given a whole box of fresh ones to look at and even smell – the aroma can really only be described as “strawberry fresh with a hint of pine”. They are very sweet, and differ from normal farmed strawberries in that their texture is almost “meaty”. That property lends itself well to the dish, as the provider of another textural dimension. Just to throw a bit more info out there – the red ones are called mignonette strawberries, while the white ones (not sure if you can see it in the picture) are known as pineapple strawberries. Both with similar sweetness, though the pineapple strawberries carry a far juicier texture. Tastes as pretty as it looks! As for the goats milk sherbet, it’s probably the smoothest and creamiest dessert of the night. No wonder, as sherbet is essentially sorbet + a little bit of milk fat. Hey, if you’re going to blow $130 on 8 desserts, you’re not going to count calories, right? As for that quintessential “goat” flavour, rest assured that it is there, though not intensely so. 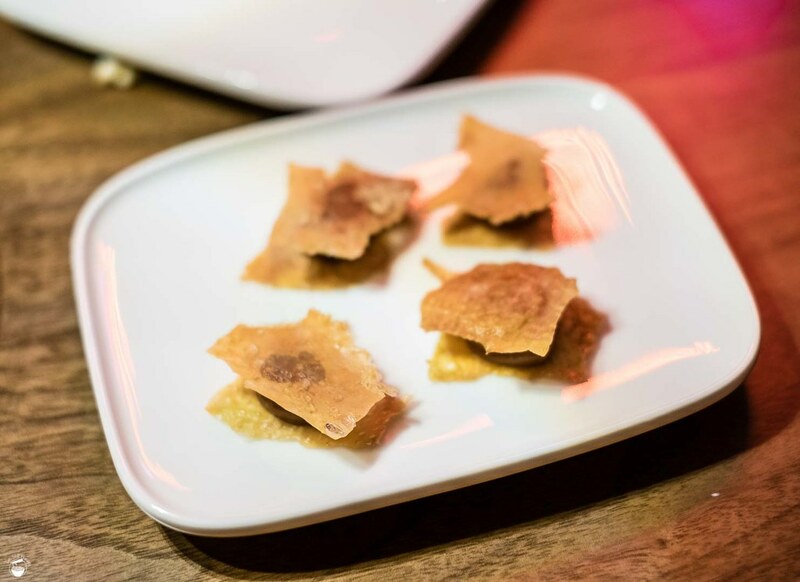 The liquorice tuile has a nutmeg-like taste, and carries a hint of spiciness. It’s very crunchy and sweet – to the point where it threatens to overpower the goat’s milk sherbet. I think for me, this aspect of the dish could be dialled back somewhat. Now, the juice pairing – white grapes, green apple & mint. About 4/5 acidic and 1/5 sweet, this juice pairs very well with the above dessert, cutting through its sweetness with each sip. Very contrasty, very refreshing. Those granny smiths pack a punch! This is the course that was described to us as potentially being the most confronting. 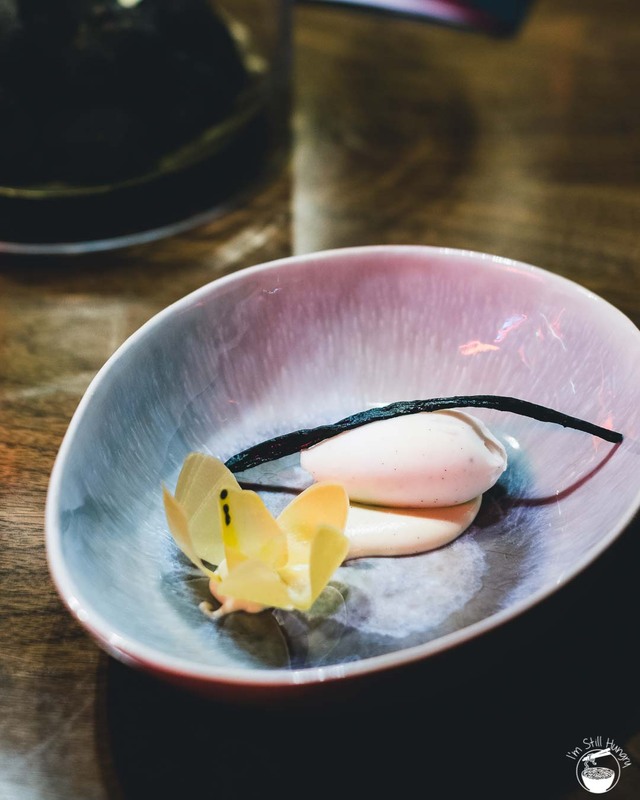 Yep, these are white garlic (Mudgee, NSW)/black garlic & vanilla gelato quenelles, both layered w/tomato & bergamot gel confit, topped with Heilala hand pollinated Madagascan vanilla (from Tonga). Garlic and gelato should not be reinforcing each other in the same sentence, but when this is one of the few actual gelatos Messina and Talbot is serving up tonight, you’d do well to lap it up. They’re bloody remarkable, and was my absolute favourite out of the entire night. Hah, you saw this coming – I’ve got a taste for the unexpected, and these particular set of buttons got pressed hard! It’s intensely savoury, sweet, full of garlicky umami but in perfect balance. The tomato is sugary sweet, and carries a texture similar to lean tuna sashimi. A very specific and odd comparison, I know, but it’s accurate. 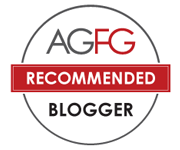 White garlic & black garlic – which do you prefer? For me, the black garlic gelato is the superior of the two – there are intense smoky notes of burnt caramel, as well as a hint of coffee in the aftertaste. Perhaps one of the most complex sweets I’ve eaten in a long time, certainly true for this particular degustation. 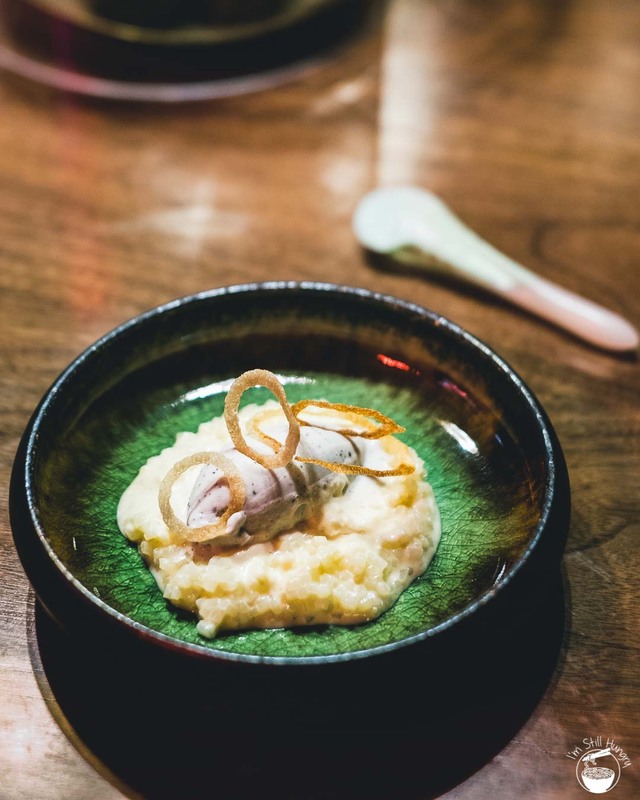 The garlic used for this dish was poached 10 times in milk to take out its harshness – as described by the staff. I can say this: the effort has been well worth it. This is a supreme example of a sweet/savoury dish executed to near-perfection. Love it, hate it, love it, hate it. Oh, by the way, the dish was paired with a hong cha (red tea) from Taiwan, which you can drink liberally should you wish to wash down the flavour of the dessert. That would be a waste though! For me, the aromatic tea was definitely an after-dessert drink. 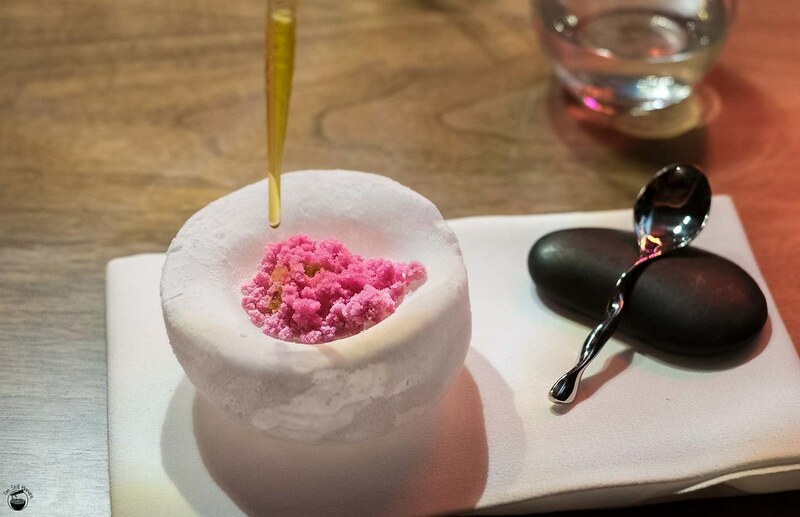 Messina goes almost Heston-style here, serving an “egg” that’s really a sugar shell encasing white chocolate & sake gelato, puffed rice, grilled figs & sake jelly. 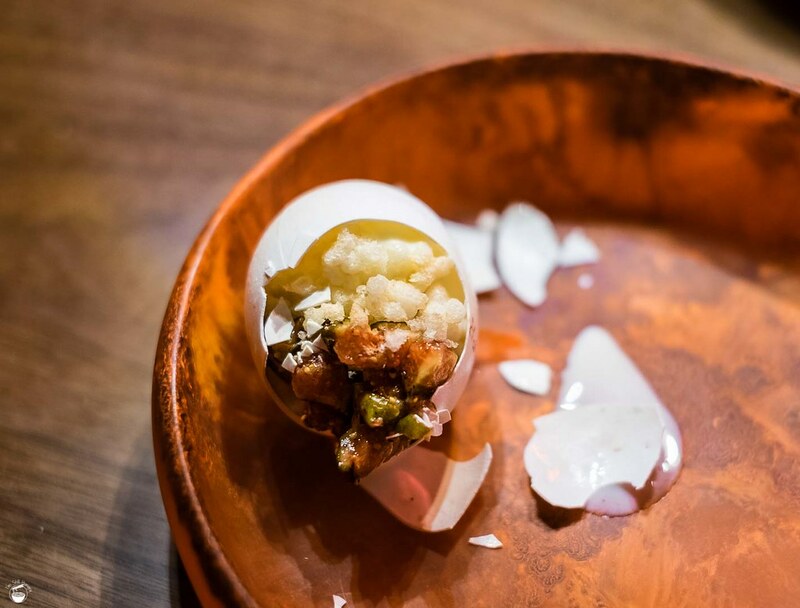 More precisely, we’re talking about 78% brushed rice sake gelato, grilled figs from Lower Portland NSW, and cacao berry zephyr white chocolate inside a mannitol egg shell (Mannitol is a type of alcohol sugar). Fun fact: mannitol is only 1.6 calories per gram, as opposed to normal sugar which is 4cal/gram. Yep, a low-carb sugar does exist HAHA! We were provided with a rather awesome spoon with a hammer end, used to break into the shell itself. Almost a shame to be doing it, especially with the branding on the shell. Absolutely loving the details here – the plating bowl included! But like all good things, they must be eaten. Actually, I failed pretty hard at smashing the egg (only those who follow my Snapchat at shenishungry will ever know why…), but in the end I got there, exposing the treasures within. It’s almost like eating breakfast. The crunchy, airy puffed rice is the analogue to cereal, the slowly melting sake gelato is the milk, with figs as fruit. The gelato itself is actually fairly weak on flavour – I could barely taste the sake. The figs also aren’t all that sweet, which meant that the strongest source of flavour was from the sugary eggshells and white chocolate. A fair warning – they are quite hard, so do have the potential to cut your mouth if chewing haphazardly. Not quite up there in terms of taste as the other desserts so far, but certainly points ought to be awarded for presentation and fun-factor! 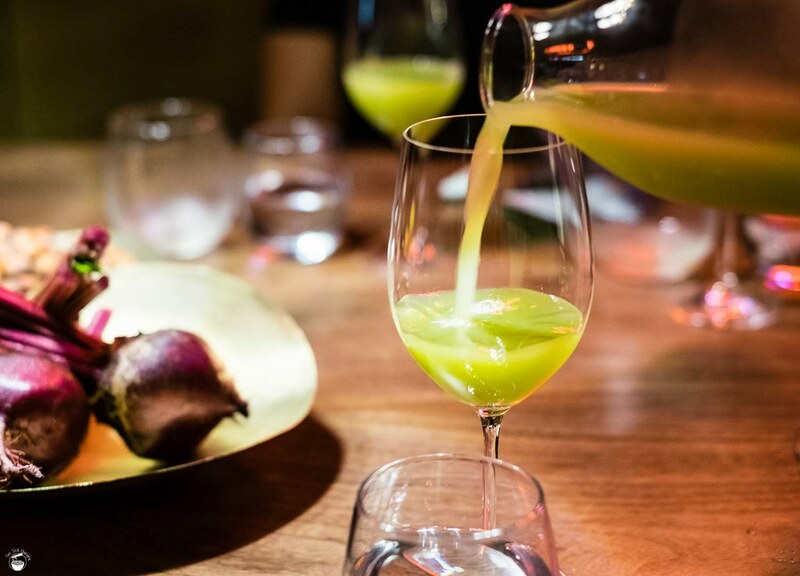 The accompanying drink is a cypress pine, green cardamom & kiwi juice which goes light on the cardamom and heavy on the kiwi, which itself is fairly acidic. 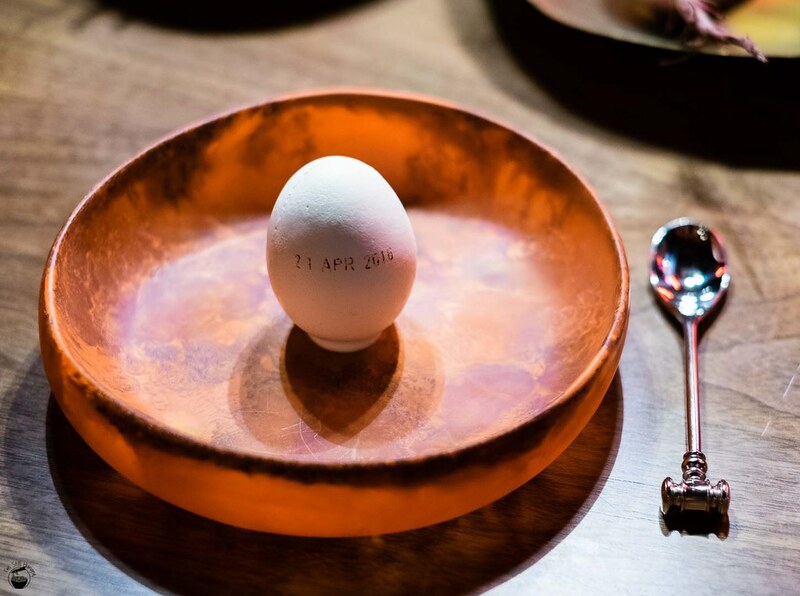 It tends to dominate the egg dish (given that dessert’s relative light flavours), and is quite texturally thick, so I drank it separately. It’s nicer that way, so I thought. A very, very close runner-up taking out my second favourite dish for the night is, perhaps unsurprisingly, a matcha gelato & pistachio cake/curd/macaron. Messina went absolutely nuts on the pistachios – sourcing them directly from the soils of Mt Etna, making these IGP (Indicazione Geografica Protetta) pistachios. That is effort, not that I can admit I’d be able to taste anything different. Now, Messina went all out here on the combo. It’s intense, in the best way possible. The matcha is strong, the fudge cake really fudgy. 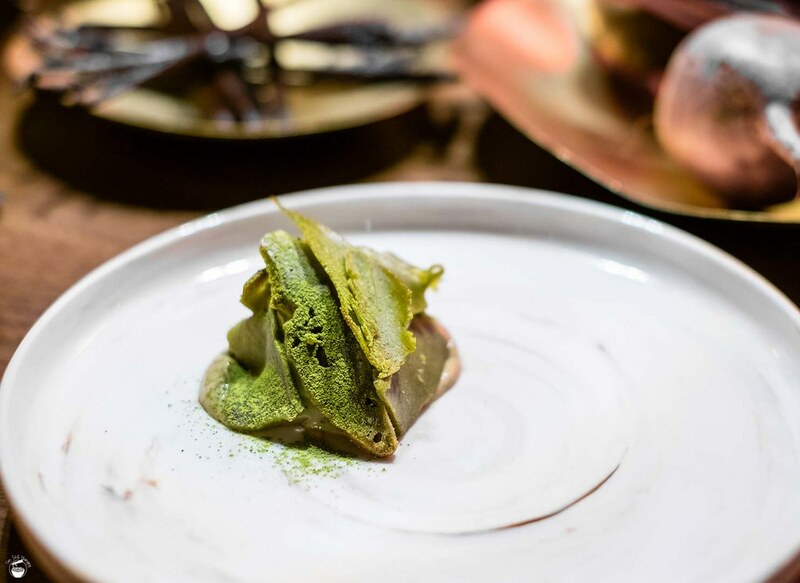 However, because it’s sliced up into “strips”, and mixed in with the cooling, creamy matcha gelato, every bite is well-balanced, and never overwhelmingly skewed in either gelato or cake’s favour. This is a comfort dessert, and despite not being as “creative” as other desserts in this deg, we all need comfort in our lives which this provides. I’m willing to wager it will be amongst the favourites for many diners to come. The gelato & cake amalgamation is paired with a pumpkin & bitter lemon oil juice. While seemingly exotic, both my dining partner and I both agreed that it essentially tasted like a cold chai latte (with a bit of extra smokiness and bitterness). My palate welcomes the classic Indian drink particularly well, so this juice goes down with no problems at all! You know what I was saying about comfort desserts earlier? Actually yeah…this is the real comfort treat. A valrhona 80% cacao chocolate sorbet, sponge, warm mousse w/aged balsamic. Frankly speaking, I should have seen this coming. I mean, come on – it’s a Frenchman doing the desserts. How could chocolate not be the kicker? Here’s the thing, some readers have likely sussed out that I’m not the biggest fan of chocolate desserts. However, here is where I am gladly willing to make an exception. This is some seriously indulgent chocolatey goodness. There’s the sorbet, which is almost superlatively smooth, and almost amorally decadent. Then we have the warm chocolate mousse, which is like hot chocolate sauce on crack – full of punchy cacao goodness. Finally, there’s the sponge, which I do actually have to be critical about. See, instead of being light and airy like a sponge cake should, this was more like a chocolate brownie. 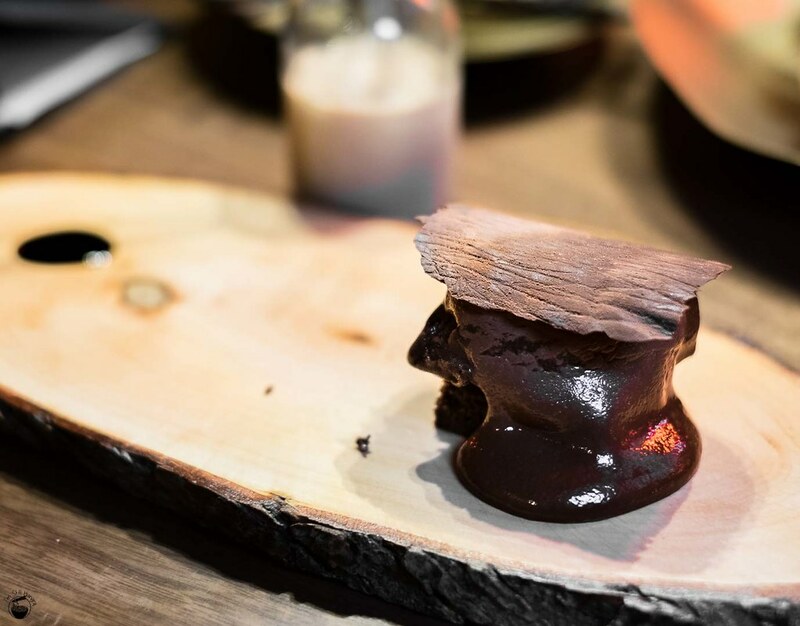 Now having said that, if the menu read “chocolate brownie”, there’d be no problems – it fits in perfectly with the hedonistic theme of the dessert. But calling it a sponge and getting a brownie…hmmm. Small matter, I was already in a coma at the time to care about it. Seriously, it’s of very little consequence. Let’s not forget about the balsamic in the background – it’s IGP balsamic from Modena in Italy, and has been aged for – wait for it – 12 years. I almost felt like I should be getting drunk off of the stuff. As it were, I didn’t think the chocolate needed it, but it was an interesting experiment to try out the rich vinegar with the sweetness of the chocolate to see what it was like. The results: not quite my thing; they didn’t gel together as I thought they might. Your mileage may vary. …uh anyways, this is a very smoky milk. It smells strongly of caramel, the aftertaste is redolent of it, however in actual taste, it’s more akin to normal milk with oak-wood & smoky flavours with each gulp. Not a bad thing really, almost makes me feel like I’m in a wine cellar. A fun little drink to end the night. Not quite yet! 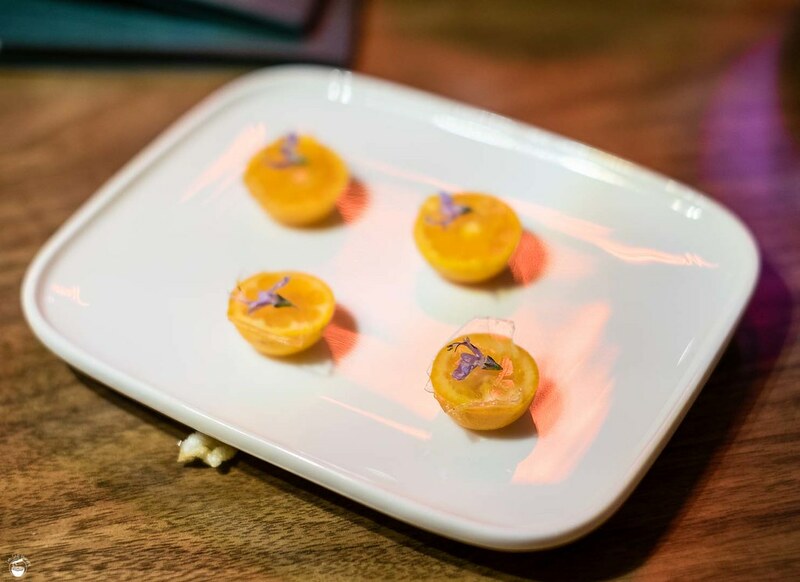 Out comes a series of petit fours – firstly, these natural kumquats which retain their natural, intensely sour notes. Pucker up folks, this is citrus overload! Up next are chicken skins & caramel miso. The only truly savoury bite from the entire deg, the introduction of these is fiendishly clever on Talbot’s part. By subjecting the palate to proper savouriness for the first time after hours of sweets lends to a palate shock that was most welcomed. Pungent miso, super crunchy chicken skins; it’s a snack that would have been well-received at any point in the meal. 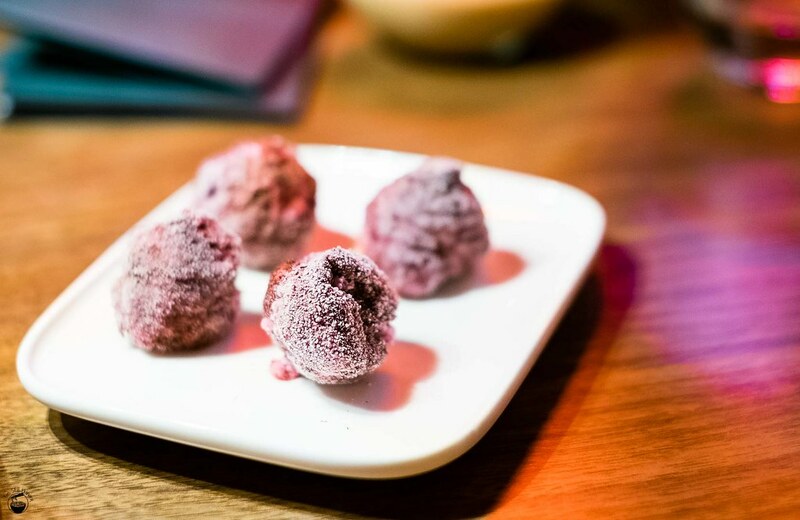 And finally, to truly end the meal, we have these beetroot balls, essentially flash-frozen beetroot mix rolled in beetroot powder & sugar. It’s a frigid bite, starting off as quite sour, then progressing to an almost savoury, earthy-like flavour before leaving a long-lasting sweet finish. Textures are very crumbly. While the food is well and truly over (cry cry), we were each given a small tub of Messina hazelnut spread to take home. I haven’t tried it yet, but I’m anticipating Nutella on steroids. Breakfast for the next few days is going to be AWESOME. 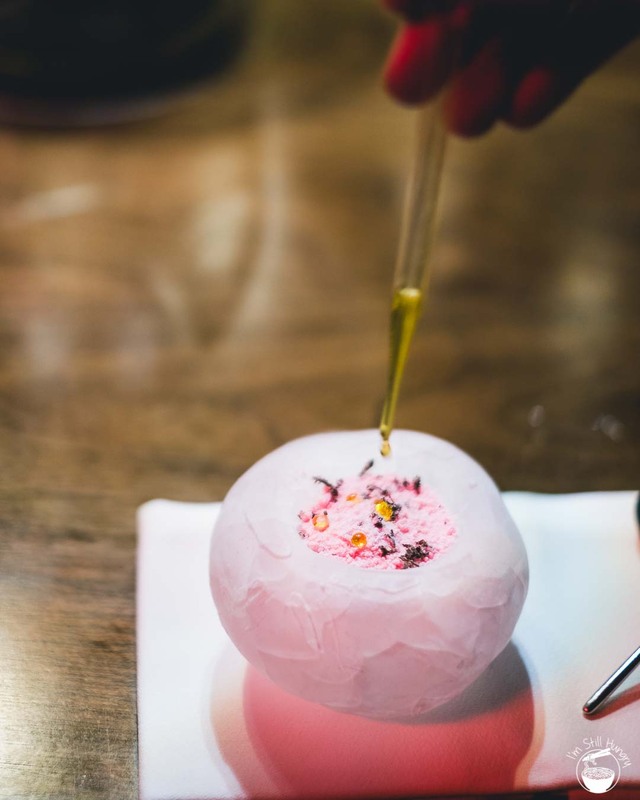 It’s the most expensive dessert bar you’ll visit; however it will be worth every dollar. And so that wraps up my first experience at Gelato Messina’s latest and greatest creation. Yes, I say “first”, because the probability of me returning is approximately 100%. 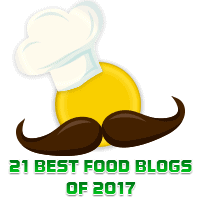 Yes, it’s expensive, but I enjoyed almost every single dish, and there were some truly innovative flavour & ingredient combinations that I would either have to pay even more money for (as the dessert course of a fine dining restaurant), or wouldn’t be able to find in Sydney at all. 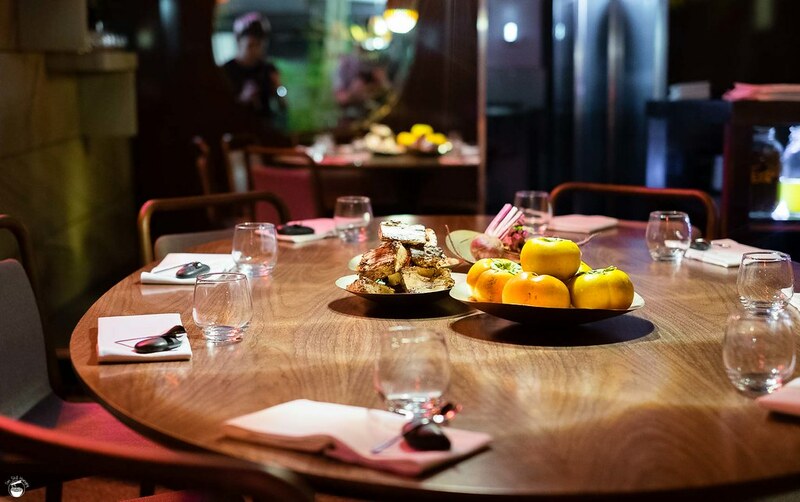 This is the gap that Messina has filled – a truly chic, luxuriant choice to cater for the most discerning & adventurous of sweet tooths that Sydney sorely lacks. I don’t have a huge appetite for sweets, however this is a game-changer for me. It’s also unfortunately, a wallet-changer. Haha. You can be sure that I will return as surely as the sun will rise tomorrow. 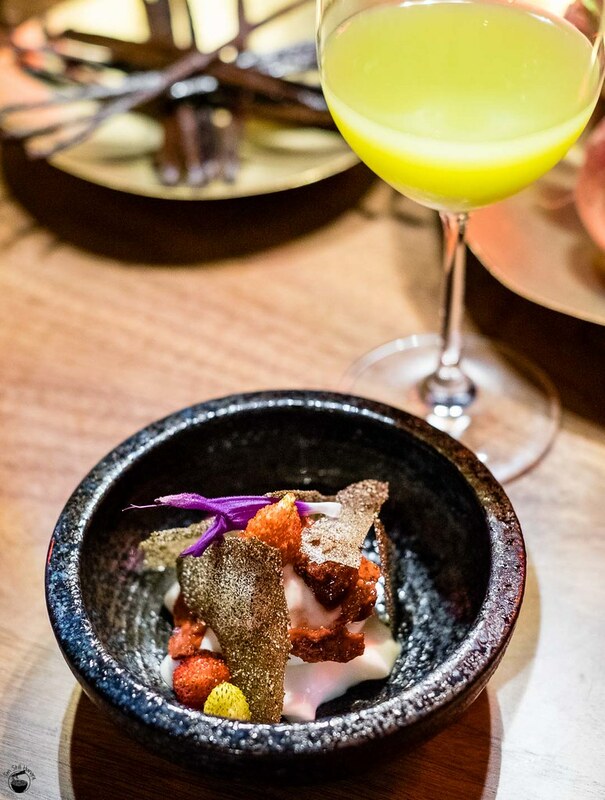 The menu will change quite frequently, with minor edits occurring on an almost-daily basis, with broader seasonal changes happening every few months. It would seem that the latest incarnation of Messina’s creative department will be around for some time to come. I sure hope it will, my business with them has only just started. Remi Talbot, I sure hope he sticks around – we’re talking creativity at another level. Most importantly, he’s daring. That will yield polarising results, but by God, that’s how we get progress. Make a goddamn booking already. Bookings available Wednesday-Saturday, 7pm & 9pm sittings. Book here. Have never seen anything like this. Very interesting. You should definitely give it a go. I’m going next Saturday, so excited. Just a question: did you eat (savoury food) prior to going? Or should I go completely empty stomached? Glad to see you’re excited – you have every reason to be! We personally did eat savoury beforehand, and felt that it was necessary. If you’ve got an average or above-average appetite, I think you’d be okay eating something an hour beforehand. THIS LOOKS AWESOME! I WANT TO GO IMMEDIATELY! Also the greatest blog post I’m literally salivating at these pictures…low light quality is top notch, tripod? Sidenote though…I see a lot of these, limited seats, communal dinning degustations in Japan (and China…Ultraviolet etc.) but not many in Sydney. Are there any good pots like this? Agreed on the rarity in Sydney. We just don’t have much going on here. As far as I know, this is the only dessert experience of its ilk (that isn’t just some temporary pop-up). Ooh I love the interactive elements in particular smashing that egg haha looks like one epic dego! Yes! Part of the reason why I liked the experience so much is due to its whacky, hands-on aspects. Highly recommended!